As in previous years, the Plein Aire Cottage Artists once again are donating a painting to be raffled. All proceeds benefit Action 2000. This year's painting will be the work of Artist Violetta and her painting is titled All You Need is Love Helen Tilston and Mary Rose Holmes have worked jointly in writing a peom to accompany the painting. 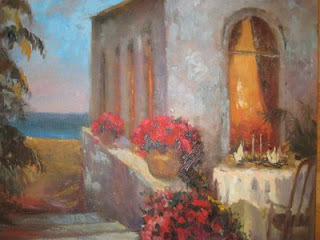 Painting will be auctioned at Valentine's Dance, February 14 2009 at City Hall, Indian Rocks Beach. This sold out annual event is pure class. My darling wraps her shawl and feels a cool chill. The Harvest Moon suddently appears...and the glimmer and the shimmer..
"Yes darling; they are plahying our song "All you need is love"
"All you need is love, all you need is love love is all you need"